Media have often been linked with the uncanny, but this has tended to be because of possible telepresence, rather than through repetition. The (more or less) repressed fantasy that underpins all media forms is that of telepathy, the distant touch of mind on mind. This fantasy is disavowed, something desired but never accomplished, and so named occult. Instead, as J. Hillis Miller argues, we employ mediating objects to accomplish action at a distance. Miller reiterates the common association between content as soul or spirit and form as body, but recognizes that turning back is problematic. As much as we may imagine media as vehicles that simply move content from one place to another, the ‘recovery’ of any content requires interacting with an object. In Orality and Literacy, Walter Ong wrote that he was suspicious of the term ‘media’ and what he called ‘media theory’ because it ‘suggests that communication is a pipeline transfer of units of material called “information” from one place to another.’2 Ong was suspicious as this conception of communication misses out the active, interpretive role of the listener or reader. However, information, or content more broadly, is never prior to its media and cannot exist without mediation in one form or another. Content is produced through an encounter with a mediating object, and its continuity is established retrospectively. Mediating objects are intentional, carefully designed to be used in ways that allow them to fulfill their mediating function. If used correctly, it is as if they are not there at all. Amazon certainly think so, claiming that books can disappear leaving you ‘immersed in the author’s world and ideas.’ As I discussed in my second post in the series ‘”Scarers in Print”‘, they claim their Kindle is so well-designed that it, too, will disappear, thus mistaking the design of the object for the use to which it is put. Books only seem to disappear because we have become so used to using them. What we call reading is a complex, learned practice that produces content by doing things to an object, sorting signifiers to distinguish between those that mark content and those that mark the mediating object. As Leah Price has recently explored in How to do Things with Books in Victorian Britain (Princeton, 2012), the Victorians did not just read books in one simple way, nor were they just for reading. It is easy to overdetermine objects and see them as bound up in a readily comprehensible materiality that is limited, bounded, and fixed. Yet, what we think of as relatively uncomplicated objects are actually the socialised surfaces of unknowable things. As Bill Brown agues in ‘Thing Theory’, thingness comes both before and after the object and so ‘amounts to a latency (the not yet formed, or the not yet formable) and to an excess (what remains physically or metaphyscially irreducible to objects).’3 If objects are on the threshold of an unknowable but productive materiality, then the subject-object relations they produce at any point can only be provisional. Derrida calls the provisionality of intentional objects ‘destinerrance.’ For Derrida the iterability of any meaningful mark, whether letter, sign, or number, means that it can always withdraw from any intended context and function in any number of others. What appeals to me about this formulation is that it includes objects, too. Although Derrida is interested in the word or the sign (and the relation between word and sign), he turns to the postcard for his example as it, crucially, is portable (so it can wander) and is open to anybody’s eyes. For Derrida, the possibility for interception pluralises sender and receiver. Meaning does not reside within the (potentially) intercepted object, but rather in its moment of reading; as such, there are many potential senders and many potential receivers. Mediating objects can function variously, summoning up all sorts of origins and destinations, virtual and actual. A good example of this can by found in Mugby Junction. The first story, ‘Barbox Brothers’ introduces us to the eponymous character and sets out the conceit for the issue. Each of the seven narratives stands for one of the Lines that Barbox Brothers might take. 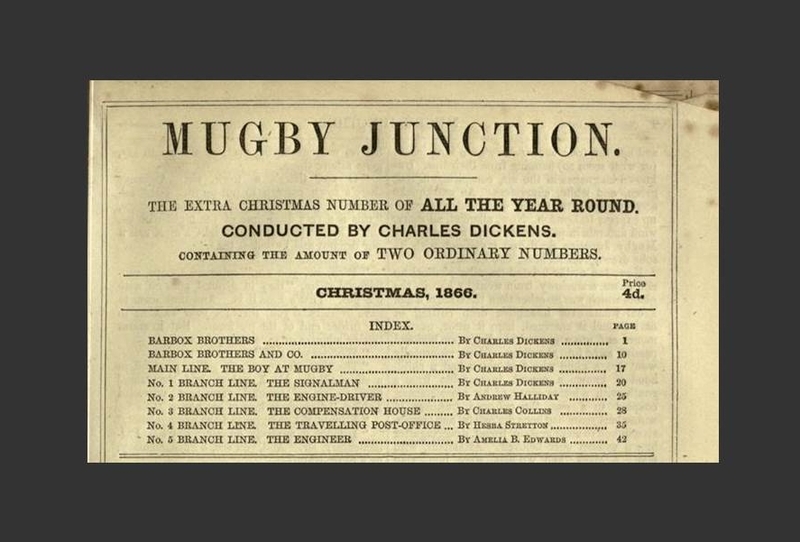 Dickens wrote his contributions eighteen months after the Staplehurst rail accident that emperilled both his lover, Ellen Ternan, and number sixteen of Our Mutual Friend (only the latter was acknowledged publicly). In the fourth narrative, ‘No 1 Branch Line. The Signal-Man’, Dickens offers a ghost story that explores the way that messages create sender and receiver as they move through communication networks of various kinds. When the narrator meets him, the eponymous signal man has been twice warned by a ghostly figure of some impending tragedy that has subsequently occurred. The signal man is worried as the figure has returned for a third time, repeating the first warning and ringing the signal man’s electric bell. Neither of the previous warnings provided enough information to avert the disasters and, if the purpose of these appearances was to affirm their truth, he wonders why these recent appearances are equally vague. At the conclusion of the story, the signal man is killed in a train accident, the driver of the train signalling for the signal man to get out of the way in the manner of the ghostly warnings. The ghost’s various warnings only make sense in retrospect. As the signal man himself realises, prior to the accidents their only meaning is as an annunciation without any content. It might appear that the ghost is trying to tell the signal man something, but it merely states the empty forms of its media, whether this is a ringing bell, a shout, or a gesture. These forms become filled with content, become legible as warnings, only after the accidents take place. The narrator does not witness any of the uncanny actions of the haunted media, just hears about them from the signal man; nonetheless, it is his account of events that fills the media with meaning. If there is a ghostly agency at work, it turns both signal man and narrator into media. This is a story punctuated by anxiety as to the origins of messages and it implies that everyone is at the service of signals from elsewhere. When the narrator first meets the signal man, the signal man mistakes him for the ghost because of his cry, ‘Halloa! Bellow there!’, and so looks the wrong way.4 Yet the narrator, looking at the signal man’s ‘fixed eyes and […] saturnine face’ suspects that he too ‘was a spirit, not a man’ (21). Unsure of the narrator’s mortality, the signal man avoids touching him when they first meet, and so witholds his tale. However, once assured of their mutual corporeality, the signal man recounts his tale, repeatedly touching the narrator’s arm, establishing a contact between man and man that, subsequently, creates a channel for the ghost. The signal man’s account, once told, creates a problem for the narrator, who is uncertain to whom the disclosure should be reported. In the final paragraph, the narrator admits his complicity in this spectral circuit, this transference and counter-transference, noting that the words of the train driver immediately before he struck the signal man, ‘“Below there! Look out! Look out! For God’s sake clear the way!”’, combines the words of the ghost (which were also called out by the narrator when he first met the signal man), ‘“Halloa! Below there! Look Out!”’, with the narrator’s verbal description of the ghost’s gestures, which he interprets as ‘“For God’s sake clear the way!”’ (25). The death of the signal man ends the narrator’s uncertainty as to what to do with his account and allows him instead to tell the tale to the reader. Hillis Miller claims that ‘given medium is not the passive carrier of information. A medium actively changes what can be said and done by its means’.5 Whatever spectral agency that is at work in ‘The Signal-Man’ uses the media at hand, but can only communicate its performative affect. The narrator’s narrative, on the other hand, places the events in order and so fills both the ghosts and the signal man’s signals with content. If one of the purposes of narrative is to store and transmit stories, allowing them to be retold in different ways in subsequent tellings while still retaining a degree of integrity, then narrative too is a form of storage and transmission media. The uncanny agency identified as responsible for the moving things in the ‘Signal Man’ is an effect of its mediation and remediation. Its uncanny presence – that there is something out there, trying to warn the signal man – is only realised by a further shift in media. This, too, invokes a ghost, Dickens himself, who serves as the originary source for the signal; however, this ghost can be dealt with, bounded and known by the institution of authorship.